Spend the next few days exploring this incredible city. Getting around Beijing can be rather slow going and confusing, although the underground network is cheap and efficient. Our top way to explore is to hire a guide for the day to take you to the main sites, travelling by underground, bus and on foot - explore like a local, with a local! Spend the next few days exploring historic Xi’an. 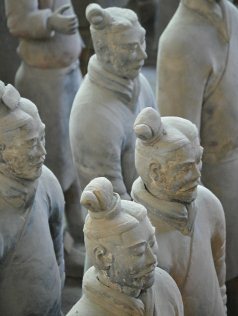 By far the biggest attracting in the Xi’an area is the incredible Army of the Terracotta Warriors, outside of the city - we’d highly recommend prebooking a trip here as it’s fairly tricky to get to, but the site is incredible and will leave you speechless! Transfer back to Xi’an airport for your flight to Hong Kong. On arrival, you'll be met at the airport and transferred to your hotel, for a three night stay. Our stopovers in Hong Kong are extremely flexible so if you’d prefer a shorter or longer stay just ask! Spend the next few days exploring this cosmopolitan city. The restaurants and cafes of Tsim Sha Tsui offer some of the best food we’ve ever had, make sure you eat where the locals do! Transfer back to Hong Kong airport for your onward flight to Phuket. On arrival you’ll be met and transferred to your chosen hotel, for a seven night stay. A wide range of hotels is available and durations are flexible, so you can stay for as long as you wish. Spend the rest of your stay in Phuket relaxing on the beach, exploring the island and soaking up the Thai atmosphere. Return transfer to Phuket airport for your return flight to the UK. See the Great Wall in Beijing, the Terracotta Army in Xi’an, Victoria Peak in Hong Kong and so much more besides, then relax in Phuket, the beaches here are really stunning! 2019 Beijing, Xi’an, Hong Kong and Phuket multicentre package holidays Prices are per person based on two sharing.